This is a service for having a wrap you've sent to me turned into a ring sling, not for a complete sling. Please take a moment to read through the wrap conversion information page and the tabs above before ordering this service! Most of the questions I get from new customers are answered there -- please read before proceeding! If you indicate below that you have read the page, but have ordered something I cannot provide, I will proceed as best I can (this may mean changing the hems in/out to accommodate pattern orientation) and you agree that I will not be held responsible if it's not what you wanted. I explain everything about this process in the WCRS information page. If anything is not clear to you, please email me before ordering. Explanations of options are also provided in the [i] icons next to each option header. If you are buying a piece of someone else's wrap, I have a form you can fill out that can be sent to the seller, to ensure that everything goes smoothly. Please read more about it on the WCRS info page under "I'm buying a piece of someone else's wrap. What do I need to know?" Again, please take a moment to look through the wrap conversion information page before emailing me with questions, or selecting the options for your conversion below. I have spent hours on that page trying to make sure all the questions are answered. Please do not be offended if you email me with a question that's been answered there and I just copy-and-paste the answer. You will get a status update from the cart when I receive your wrap. To ensure that this and other status update messages do not end up in your email spam folder, please add orders@sleepingbaby.net to your whitelist (Yahoo and other email providers will often route these status emails to spam otherwise), or check the spam folder for messages. If you want your wrap split into two ring slings and both are being sent to you, you can use the "quantity" box below to add two to your cart, if the options are the same on both. In this case, keep in mind that the insurance value you select will be doubled. If the slings together are worth $200 for insurance purposes, select the $50-100 value and it will double to $200. If you want different things done to each sling, add one with its options to your cart, then click "back" a couple of times and add the second sling with its options to your cart. In this case, select insurance value only once, for the full value of the package. If they are being sent to two separate addresses, however, please place two *orders*, because shipping is calculated on a per-order basis, and if you add two slings to your cart and request that the second be sent to another address, I need to invoice for the additional shipping and the process creates a lot of extra work for me. Scraps: I always return customers' scrap pieces. The selector below that mentions the greater than a half-meter piece returned is so that shipping is calculated correctly, since a long piece of scrap will make the package more than a pound. I will return scraps regardless of what's selected, but will invoice for actual shipping if you don't select that one and shipping paid isn't enough. I can convert ONLY new-with-tags, unwashed, Tekhni Repreve blend wraps at the moment, because so far, that's the only one I've tested with. Orders for any other manufacturer, blend, or for used wraps will be refunded, and pieces sent will be returned unsewn. *Length required is based on measurements at the midpoint of the taper. (e.g. if the taper depth is 8", add 4" to the length required to get the length on the long taper). 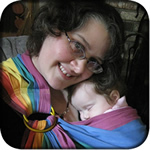 I have had countless ringslings made by sleeping baby productions. Her turned around time is quick and her communication is excellent. Her website has so much information on it and she is quick to respond to emails or Facebook if you have any questions. One time one of my slings was sewn the wrong side out. She offered to refund me shipping and was happy to resew the sling at no charge. Her eesti shoulder is so comfortable and she has 3 other shoulders to choose from. Something for every shoulder shape and preference! If you need a ringsling, this is where you should have one made! Generally your snug-fitting t-shirt size. Click the Sizing/lengths tab above for a calculator, or see the sizing page for more in-depth information. Wrap description Name, color, and other identifying characteristics. I can convert *only* Tekhni Repreve blends or Girasol broken twill weave at the moment. Orders for any other brand/blend will be refunded. Which side out in the body of the sling? 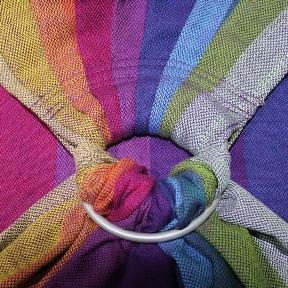 My standard procedure is to sew the sling with the hemmed edges facing outwards in the body of the sling. That corresponds to the image on the left-hand side. I find this to be very slightly more comfortable for the wearer and baby, since then the hem isn't facing into you -- if your skin is very sensitive, this can be an issue (although for the vast majority of users, it is not). From a cosmetic perspective, the tail is usually more exposed than the body of the sling (since the bottom edge should be bunched up under the baby's knees anyway, and the top edge can be rolled so that the hem does not show), so that having the hems out in the tail is more obvious than having them out in the body of the sling. However, if your wrap has a wrong side (which is usually not an issue for striped wraps, rather, only on jacquard-woven wraps), this does mean that the wrong side is out in the body of the sling. If the wrap is tapered, this does also affect the side the long end of the taper falls on, so if that is important to you, please hold the wrap up on yourself as if you were wearing a sling to decide which way you want it sewn. If there is a conflict between the right/wrong side out and the desired pattern orientation on a wrap that doesn't have an obvious wrong side, I will favor the pattern orientation over any hemming preference. Please do your best to describe which side you want facing out in the body, as otherwise I will need to email for clarification, resulting in delays. There is another consideration when splitting wraps that have a directional element -- please read the WCRS info page for further details. You do not have to pick a primary shoulder -- the one you will be wearing the sling on the most often -- if your sling does not have a directional element (like fish, birds, or asymmetrical stripes), if you will be switching shoulders frequently, or if the directional element doesn't matter to you. As an example, the same sling is used in both figures at right -- worn on the right shoulder, the red rail is on top; and worn on the left shoulder, the pink rail is on top. (The bottom rail doesn't show when worn because it's tucked under the baby's knees.) So if you specify in the special instructions box that you want the pink rail to be on top, I need to know which shoulder you'll be wearing the sling on, since the color shown on the top rail will change depending on which shoulder you wear the sling on. This "primary shoulder" is only for orienting patterns, since both shoulder styles can be worn on either shoulder. However, if you specify an orientation preference, I must know which shoulder you will be wearing the sling on -- selecting "doesn't matter" means I can't take the orientation into account and will have to email you for clarification, resulting in a sewing delay. All scraps are returned with the slings. The selectors that deal with scraps is just if the piece is going to affect the weight of the package -- a long scrap will usually bump the weight up to the next shipping price interval, while a little piece will not. I do not keep scrap pieces, so if you don't get anything back, it means there wasn't anything left over after cutting and sewing. If your scrap is longer than a meter and affects the weight of the package, but you have not selected that option, I will send an invoice for the difference and expect it to be paid promptly. Unhemmed portion shipped separately would be if you had a long wrap and I were converting part of it, but the remaining longer piece would be sent untouched to another buyer or to another conversion artist. This need not be selected if another buyer is having the remainder hemmed in a separate order with me. If all you're having done is a WCRS with a wrap that has a normal taper (between 2-10" in depth), you probably won't need additional hemming -- in that case, select "No additional hemming needed". You do not need to select this if ONE short side of your wrap is cut, but the other is hemmed, unless the pattern orientation would be incorrect for you (and there's enough length to re-cut the taper). Having one side cut is pretty typical for sling-length pieces, and that's the end I would use to make the sling, so it doesn't need to be re-hemmed. If you will be splitting a wrap with a directional element and one will be upside-down (please read the section in the WCRS info page labeled "I'm splitting a wrap into two pieces -- is there anything else I need to know about pattern orientation? "), AND there is enough fabric to re-hem the second sling, then you would select this to have the sling re-tapered to fit the requested shoulder/pattern orientation. Also, some people prefer a wrap with the tail cut straight across instead of on a taper; and some wraps, like Ellevill, have an extremely deep taper, which can make the sling feel very long even though it's the correct size at the center of the taper. In either of these cases, you'd select "Sling: re-taper (for too-deep tapers or for design orientation)". If you want the remainder of a long wrap (please use the calculator on the WCRS info page to figure out what lengths you can get from a wrap) turned into a shorty after part has been made into a sling and both portions will be sent to the same address, select "Shorty: Re-taper/hem, move MM, and send along with sling". This will add $12 for the hemming service, plus add to the total shipping weight, so that the final shipping charge is calculated correctly. If the shorty will be sent to another customer, please place two orders, or I will have to invoice for additional shipping.